There is a certain inevitability about yearly iterations of most sports games. You know what you are going to get: updated rosters, maybe slightly prettier graphics (only slightly) and some gameplay change that they claim will alter the game forever, but which is soon forgotten or simply melded into the next game and quickly becomes stale. The FIFA games have proven themselves particularly adept at picking out a meaningless feature that doesn’t much change anything yet they’ll hail it as the next big thing. It’s not necessarily the worst thing in the world, however, and millions of people continue to buy the FIFA games every year, so they must be doing something right, but it can be tiring for those of us who aren’t all that interested in whatever new non-feature they created just so they could slap it on the back of the box. I’ve developed a habit of picking sports titles up a couple of years late, after they sharply drop in price, but they’re still plenty of fun, because they are still pretty much the same game. I’m afraid I can’t say that about NBA 2K14. Apparently the focus of the team working on it was two pronged: to be super-authentic (I guess that means no Space Jam mode) and to best whatever they accomplished with last year’s game. Considering the quality of 2K13, this is no mean feat. By far the most impressive improvement that they have made is the addition of over three-thousand new animations. It’s an incredible achievement considering that this is a yearly franchise, but the results are worth whatever effort they put in. While the NBA games were never particularly slow, the new animations suddenly make everything appear to be almost lightning fast, and fluid to boot. Where there were lengthy animations for certain moves that had to finish playing out before you could move on to the next, now everything is sharp and crisp, with inputs being followed almost instantly. Every move becomes more satisfying, especially when defending, which has been the main beneficiary of the extra animations. There are all-new blocking animations, which allow for exciting things such as blocking dunks and more consistent shot blocking. There are also new collision models that allow for better impacts during moves and in-air collisions for layups, dunks and rebounds. Although the extra animations are the biggest and most visible addition, there are other new enhancements that are equally influential. The new “Pro Stick” control scheme, for example, completely changes the way that passing and dribbling works, and actually fits surprisingly well into the new, more fluid feel of 2K14. It also greatly simplifies the dribbling mechanics, with taps of the right analogue stick being all that’s necessary to pull off a crossover or spin. When you have a shot lined up, all it takes is to hold down the analogue stick and your player will go into the shot motion. Then there is passing; a simple pass is a tap of the A button – or X, depending on the platform, so substitute your own buttons from here on in – but they are easy to read and liable to interception. Trick passes are a little less accurate, but far less likely to be interrupted. To pull one off you would pull the left trigger and flick the right stick in the direction you want to send the pass, then sit back and watch the animation. There have also been several balancing changes to steals and passes, ensuring that the game still feels fair and natural with the slightly higher speed. If you are anything like me, and the vast majority of your basketball knowledge is relegated to Space Jam, then the addition of the Smartplay feature will probably open your eyes to how terrible you truly are. It is horribly difficult to explain, however, so forgive me if I do a bad job. The idea is that during a match you will be shown the play that the AI would run, highlighted by a glowing line on the court. If you choose to enter that line, then the play will be run, with the AI suggesting what to do and when. For veterans who actually know what they’re doing, there is the option to dim the Smartplay feature, or to turn it off completely. LeBron James plays a massive part in the features included. He was the architect of the playlist that you’ll hear whenever you are in menus, as well as the rather cheesily named “Path to Greatness” mode, which actually looks to be very interesting. Rather than simply retelling the story of how James became one of the best players in the modern game, it instead casts an eye forward into the short-term future of the NBA. The idea is to get James into the Hall of Fame within the space of seven years, and I very much got the impression that it may well be tongue in cheek, although it certainly looks like it could be enjoyable. 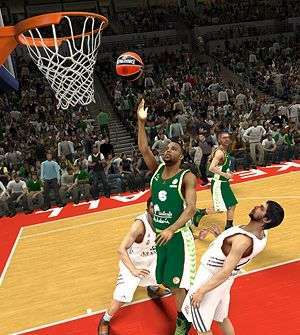 Another new addition to the franchise is the ability to play as several European teams. 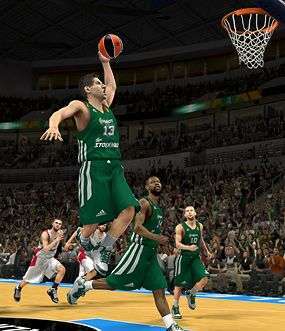 2K collaborated with the Euroleague to select the very best teams in Europe. As the Euroleague plays with different rules to the NBA, this is reflected when playing either as or against a Euroleague team, as long as they are playing at home. If they are, then the three-point line will be closer, and the top of the board will be within the bounds of the court. They will not, however, be playing at their actual home courts, as those have not been licensed for this edition, but this may well change in the future. Perhaps the least obvious of the new features, but perhaps one of the most impressive, is the daily stat dump that will adjust the stats of each and every player in your game according to their current performance. If they are on a particularly good shooting streak, then you might find that their ability to shoot accurately will increase. If they have recorded a ton of blocks in their last few games, their blocking will go up by a few points. It’s a small thing, but I have no doubt that it will be one of those little things that makes it feel completely different, not to mention how impressive it is technically. There is a returning feature as well, one which has been absent from the last few installations – Crew mode. This is allows you to team your custom player up with the other custom players from your friends and to create a Crew that can take on other teams from around the globe. It looks to be great fun, and it could be the sort of thing that gets you invested almost without trying. Since its removal it has been the single most requested feature, so clearly it is well loved, and shows just how much the team wants to ensure that this game is better than its predecessors. The dedication to ensuring that NBA 2K14 is better than 2K13 is hugely impressive. Each new feature feels like it has been mulled over considerably before being green lighted, and each of them add to the game, no matter how small their role may be. What’s more impressive is that this is only the current gen version – 2K have promised that the next gen version will be a completely different experience. It would have been all too easy to relegate this version to the back seat and release a game very similar to the last one, but they have not been content to rest on their laurels. 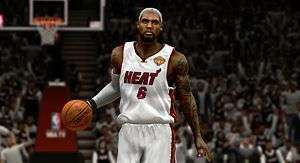 I cannot wait to get my hands on NBA 2K14 for more than the few minutes I had to try it out. I want to see what the player creation is like, what the next seven years – according to 2K – hold for LeBron James and just how much gameplay has changed with addition of all those animations and the Pro Stick. More than anything though, I just want to play it. I want to sit down and attempt my terrible plays, score a few dozen three pointers and even try my luck at a dunk or two, even if I can’t stretch my arm like Michael Jordan. It may only be a few weeks until it comes out but I, for one, can hardly wait. And yet again no updated features mentioned about online play, which means it’ll be the same sh*tty lazy effort as 2k13 for pc, where all the classic teams are unavailable, and you can’t even play against a friend without sitting there on xfire or something and attempting countlessly to connect to the player by random luck. They can polish the turd all they want, for a game that requires another player to play against to be fun, they sure like to dungpunch the fun right out of it..